"The K‐300i incorporates a newly developed amplifier circuit design with Krell iBiasTM technology that delivers 150 Watts/Channel into 8Ω and 300 Watts/Channel into 4Ω. iBias provides the sonic benefits of Class A operation without the excessive heat and power consumption of traditional Class A designs." "A 771VA transformer with 80,000μF of capacitance forms a potent power supply for excellent signal control and dynamics. 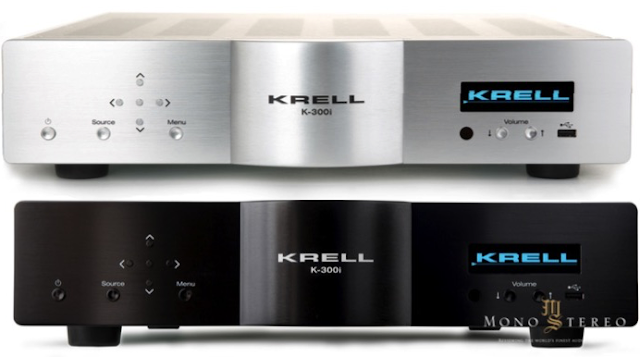 Krell Current Mode topology is employed with fully differential circuitry that runs from the input stage through to the last output gain stage providing an extremely linear and extended frequency response curve with smooth, effortless highs and extremely dynamic bass energy. Packed with many of Krell’s most musical‐sounding technologies, the elegant chassis is living‐room‐friendly. Yet it has enough power to achieve incredible, lifelike dynamics with any speaker. The front‐panel menu system provides configuration features such as input trim. Theater Throughput mode lets the K‐300i serve as the core of a surround‐sound system without sacrificing two‐channel sound quality. Analog Inputs include three stereo RCA and two stereo balanced XLR. High‐quality gold‐plated speaker cable terminals provide a secure, electrically ideal connection. The K‐300i also offers features that make it perfect for custom installation, such as 3.5mm jacks for IR input and 12‐volt trigger input and output. Additionally, the unit has an internal web server that is optimized for tablets and provides a remote graphical user interface for convenient and intuitive control accessed through its Ethernet connection. With the digital option installed the K‐300i becomes a world class DAC with the connectivity and features to support the latest digital music formats. An ESS Sabre Pro DAC configured for high current output performs the digital to analog signal conversion for uncompromised reproduction of digital music. A network streaming audio renderer with dedicated mobile App plays AAC, ALAC, AIFF, FLAC, WAV, WMA, and DoP files up to 192kHz/24‐bit from UPnP music servers or NAS devices. The digital option also provides Spotify, vTuner Internet radio, Tidal, Deezer, and QoBuz streaming services, is Roon Ready and decodes MQA. HDMI 2.0 inputs and output supporting 4K UHD with HDR are available for TV viewing with audiophile grade sound quality. A single USB host port is available on the front panel to play music from USB flash memory sticks and a USB device port is positioned on the rear panel for streaming music directly from a computer. The digital option also includes a Bluetooth receiver featuring Qualcomm® aptXTM audio technology for the best sound quality when connected to aptX enabled Bluetooth devices. "When developing the K-300I, David Goodman, our Director of Product Development, whom has been with Krell since 1987 and was largely responsible for design work on all Krell products since his arrival, discovered that with modifications to the output stage, we could vastly improve sound quality, across the board, to all of our amplifiers." Retail pricing is US $7,000 in analog and US $8,000 with digital.